After 2 comps NSW WA returned to its ultra-reliable venue, Gerroa. The seabreezes have been coming in early this season and this magic section of Seven Mile Beach had thrown up some great conditions in previous weeks. The alternative venue for this event was to be Windang if the wind was southerly however the forecast was looking pretty weak for event sign-on Saturday morning. There was the faint chance of enough wind for a free sail or some swell for a SUP competition. However, as conditions were pretty average it was decided to relocate to Gerroa by mid-morning. The advantage was those competitors coming down from Sydney were able to drop-in to register and continue on their journey while south coast competitors did not have as far to drive. 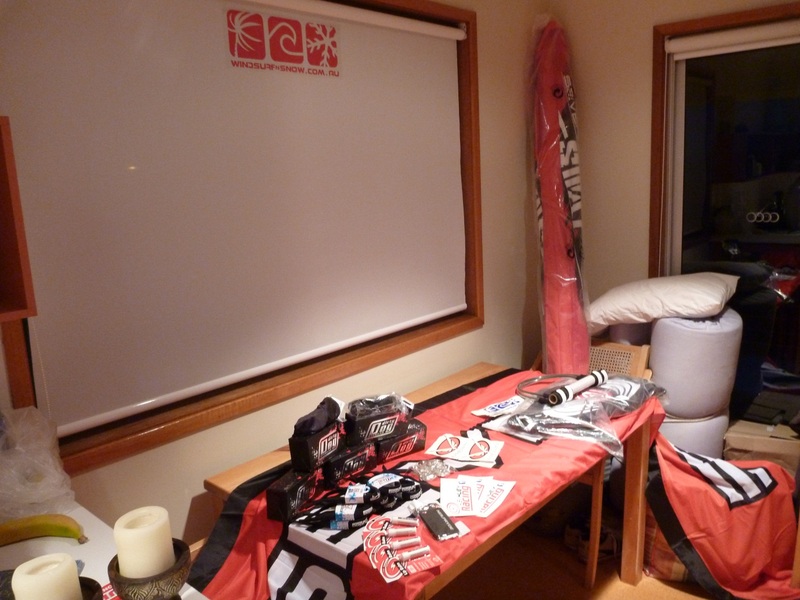 The real benefit was so that the judges could run the SUP comp from the balcony of the event house! With 18 entries ranging from a sponsored adolescent to newbies taking up SUP in their senior years the SUP comp was held in some nice peeling lefts and rights on the main beach. Tom Cohen, riding a JP board, was the standout during his heat and the final making best use of being a goofy footer, taking the lefts all the way into beach. Or perhaps he was just surfing ‘switch-stance’. Kai Bates, now riding for Fanatic, managed to storm home in the final with his last wave to take the win with a nice air and a small cover-up in testing conditions. Matt Coleman, a first timer, used surfing skills to the max and proved that you don’t even need a paddle. So was Jason Juretic who managed a clever head stand to capture the judges attention. It’s great to see so many wavesailors take up stand-up paddling as a complementary sport and it’s not uncommon for competitors to be discussing if they are on an 8’5” or 8’10” while rigging their gear. After a great day in the sun the SUP competitors merely had to walk back to the event house and make preparations for the social and prize giving. As usual the BBQ was fired up and ‘sausage king’ Jase made sure that the snags were ‘smoking’! Marinated chicken along with gourmet salads (although the dressing came from a bottle) rounded out the feast that was laid on for competitors. Adrien Garcon once again donated all the bread from Bakers Maison and no one could fault the combination of crusty French bread, cold bear and good conversation. Club President, Tim Williams made sure that winners and place getters from events 1 and 2 received their prizes and presented Jason Cater with a brand new Severne SWAT 5.2 that he won in the raffle! 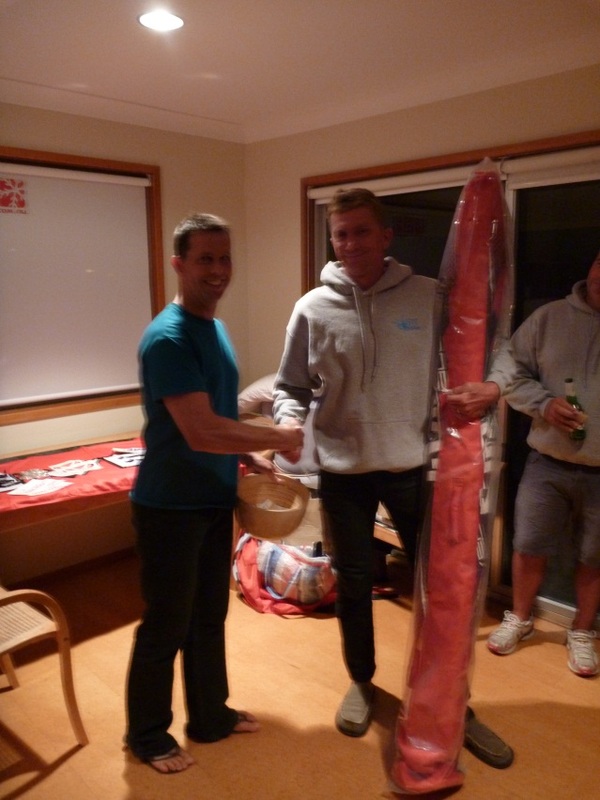 As there was no official wavesailing competition, prize giving for the WindSurfnSnow event will be held over until our next event at Cronulla in a few weeks’ time. The festivities moved on to the Fisho’s to down a few drinks in honour of Steve ‘Robbo’ Robinson’s birthday until just about closing time. The event house woke mid-morning Sunday with quite a few bodies littering the floor and even on the front lawn which was according to one competitor “rather comfortable”. The real question of the morning was who had broken the toilet? Someone heard it shatter but the culprit has remained rather quiet. A quick trip to Bunnings, along with the plumbing skills of Adrien Levy and Tim and the problem was soon rectified. The wavesailing event kicked off just after 11:00am Sunday as the wind was already sailable at 9. No doubt you have seen Jason Hale’s great pics as well as those from Zac which give an excellent portrait of the day. Jason spent most of the day in the sun and wind immortalising all of us with some very, specialised camera gear. His high quality images are up on flicker and well worth the trip into cyberspace. Conditions were quite difficult and with a gusty 30 knots blowing very cross-off with small waves that at times were quite hard to find. Equipment choice was key with many competitors rigging multiple sails on multiple boards trying to select the best combination for their heat. What was impressive was the high standard of competitors who can make the most of these conditions and work their way into the finals. Great positioning in the wave zone was also required to get the most out of the testing conditions. Those competitors who stayed upwind, hunted around the break and worked hard tended to prevail. A full series of rounds was held in each division giving all sailors a double chance to get through to the final. Dean Headrie was one of the hardest working competitors on the day working his way through 3 heats to eventually claim 3rd place overall in the Pro’s. Other standouts on the day were newcomer to the Amateurs, Ryan O’Sullivan who was sporting brand new Naish Choppers in the colours of his homeland, winning the Ams division in his first NSW WA competition. The Masters looked really close between Alan Bailey, Jason Juretic and Mr Seven Squared, Steve Robinson. There is no doubt that the Masters compete as hard as anyone. In the Pro’s Simon Hansen riding a custom SSD was carving up any wave that came his way at impossible angles while Brett Goodwin was throwing his SSD as inverted as possible. Dan Berry (also riding SSD) was at his best, probably getting the most impressive jump in his heat launching into a high vertical table top/cheese roll/forward loop combo and landing clean. However it was Duncan Osborne who squeaked through the final to take his first ever win in the Pros in his usual humble manner. It was a long day in the sun and wind and the judges worked very hard to roll through over 20 heats and finals. Special mention must go to Cheryl and Sorrel who calculated, corrected and collated all the results. Also a big thank you must go to everyone who judged during the day. Neil Coleman, in particular, seemed to be forever holding a judging folder, cheering on his son Ned, checking the heat times and ferrying gear all with his infectious enthusiasm, symbolising the spirit of NSW WA. See you at Wanda on the 8th December! Next NSWWA Presents Event 4 @ Wanda! !